The new exhibit of kinetic sculpture at the MIT Museum is called 5000 Parts, which seems like a very low estimate when you consider the work of John Douglas Powers, who creates forms that mimic fields of grain and ocean waves, among other natural patterns of movement. 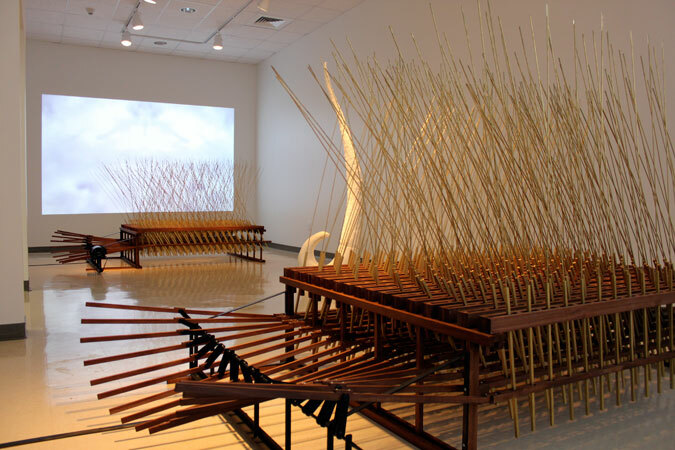 His sculpture Ialu, included in the show, is made of hundreds of wooden sticks or reeds mounted on beams which are moved by a motor. The reeds sway gently before a video of a cloudy sky. Unlike the idyllic scenes they conjure up, Powers’ sculptures squeak, clatter and groan as they move (watch video of the piece in motion here). Although in some ways his evocation of the patterns of nature is uncanny, its artificiality is also on full display. In his materials and gestures, Douglas pays tribute to nature. But his embrace of the mechanical, his unwillingness to hide the machinery, he nods to the extent – and limitations – of human ingenuity. 5000 Parts also features work by Arthur Ganson, Anne Lilly, Rafael Lozano-Hemmer, and Takis. It runs through November 2014 at the MIT Museum in Cambridge, Massachusetts. This entry was posted in The Art of Science and tagged Ialu, John Douglas Powers, kinetic sculpture, Mechanical Sculpture, MIT Museum. Bookmark the permalink.